“Experiential” is how I think of St Joseph High School. It’s an experience, and you owe it yourself to encounter St Joes in person. Experience St Joes through the students and teachers and parents who are the heart of St Joes. Sometime someone did something right here and the community just adds to it year unto year. We are very academic. We are very competitive. We are very engaged in the world. We are very college prep focused. Over and above, however, is what happens in between the textbooks and the classrooms, between the generations of teenagers and adults, among the friendships that grow in this faith-based world. We are not unique in being a Catholic college preparatory school. All Catholic schools nurture friends and family. We are special in that we don’t make you work for it. The welcome you feel when you walk through our doors is freely given. There are no initiation rites, no unspoken membership rules--you are part of the family before you know it. That’s what makes the “soul” a little bit thicker at St Joes. I know I am graced to spend my days in a place that begins and ends with prayer, where faith and morals permeate the curriculum. Each student might express it differently, but all would convey the joy they find here. If you come for a visit, you will see it in their faces. The Catholic college prep school is an intense environment, a rigorous experience. There is much to accomplish before you head off to the university. Yet, the most important achievement is not found in a textbook. It is the person you become while you are with us. That happens best within a community of friends who encourage each other. Where you go matters, with whom you go matters. As Christ abides here, we hope you will too. 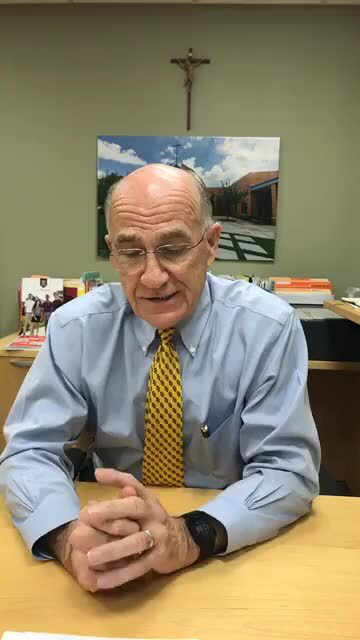 William J Fitzgerald, PhD., M.Div. St Joseph teaches us to keep an eye out for each other. St Joseph calls us to make “family” more than a platitude. St Joseph models a life lived on behalf of others, especially the poor. Our “family” contributed over 36,000 hours of service last year. We know our place in the world: we work together for others. My son counsels: be your own avatar; otherwise, you are just algorithms. Create yourself or be created by your search engines and Google ads. Our thoughts and prayers and gratitude go to the Notre Dame community for giving us such a wonderful model of life in Christ. I imagine the first thing on your mind is, is it worth it—a private, Catholic, college prep school? Let me say, upfront, I love this school. I know, I’m biased. But I wasn’t always here. Once upon a time, I was new, like you, and I had a lot of questions. People would say, “Oh, St Joes, that’s a good school.” I wanted to know what good meant. So I went to those who know best—the students. We have been talking about removing the white house since before my time. We have been in conversation with the Wojtowitz family through the years. We have been talking about the front yard ever since we acquired the Voytko property on the hill. Talking and planning, and then, whoosh, it’s underway. "I've always kind of felt like eventually it was going to happen here too… I wasn't surprised, I was just scared." St Joseph High School is blessed.